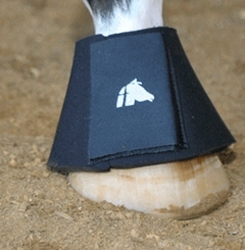 Fenwick Equestrian Bell Boots - Pair, newly designed 12mm thick, lightweight neoprene Bell Boot that does not rub your horses' pasterns. It is durable enough for turnout yet attractively designed for performance. The bell boot is 7/16" in thickness with a soft "kevlar-strong" covering that is bonded to the neoprene which helps protect the boot from tearing. The new generation mushroom velcro closure is in one piece for strength, but also for easily securing and removing. These boots are easy care...just squirt with the hose and hang out to dry! These soft and supple bell boots will protect your horse's feet, heels and coronet band with out irritation. We carry the entire line of Fenwick Equestrian products, including the Liquid Titanium Therapeutic items for horses and people, so be sure to search our site. Color: Black Medium___height 4 1/4"___bottom 18 1/2" Large_____height 4 5/8"___ bottom 19 1/2" XLarge____height 5"___ bottom 20 1/2" XXLarge___height 5 3/8"___ bottom 22"